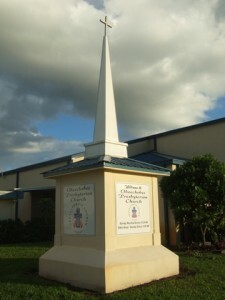 Okeechobee Presbyterian Church organized in 1980 as a mission church to Okeechobee County, the southern-most church in the Central Florida Presbytery. This official formation came as a result of many years of prayer and outreach – various worship initiatives that faithfully persisted until a solid church was born. As early as 1924, the vision for Okeechobee Presbyterian Church emerged, an evangelistic candle flickering, smoldering, and eventually bursting into flame – surviving in spite of hurricanes, changing demographics, and financial reverses. Along the way, the worship community took several forms: church, mission, and then outreach chapel of Sebring First Presbyterian Church. And then, on June 29, 1980, Okeechobee Presbyterian Church organized as an independent church. The vision lived! The church gradually grew, and eventually purchased two lots to the south of the premises, as well as revising the existing building to accommodate program changes. In the fall of 1997, God blessed the church to modify its friendship hall to house a pre-school; likewise, in the summer of 1998, extensive renovations were made to the kitchen, enabling more fellowship and outreach. The vision eventually grew into a need for a new sanctuary. So, starting with a building fund of only 40 cents, people began to dream, pray and work… and in January of 2000, a new sanctuary building was dedicated to the glory of God. The new worship space included a sanctuary, nursery, conference room and greeting area. Also, as part of the new building project, the old meeting space was renovated to provide a larger fellowship hall, classrooms, larger pre-school classrooms, offices and a food pantry. And, in spite of heavy damage in 2004 and 2005 from Hurricanes Frances and Jeanne, the facilities now gleam brightly, providing a base of worship and outreach to Okeechobee County, thanks to the grace of God and the help of many friends! The food pantry currently helps almost 500 people a month, and the services of worship and community touch many lives with the love of Christ. God has provided for the needs of this church in remarkable ways – from its creation to its sustenance and continuance – and it now enters a new season, a season of hope and joy, a fulfillment of divine destiny. At Okeechobee Presbyterian Church, we truly believe that what God calls us to, we can accomplish as we work together in faith. Come and participate in what God is doing in our midst!